In the Add FTP Account section, fill in the fields as needed. Below is a brief description of the options. Password: Enter a strong password in this field. Need help creating a secure password? Use the Password Generator button. Password (Again): Enter the same password here, to confirm the spelling. 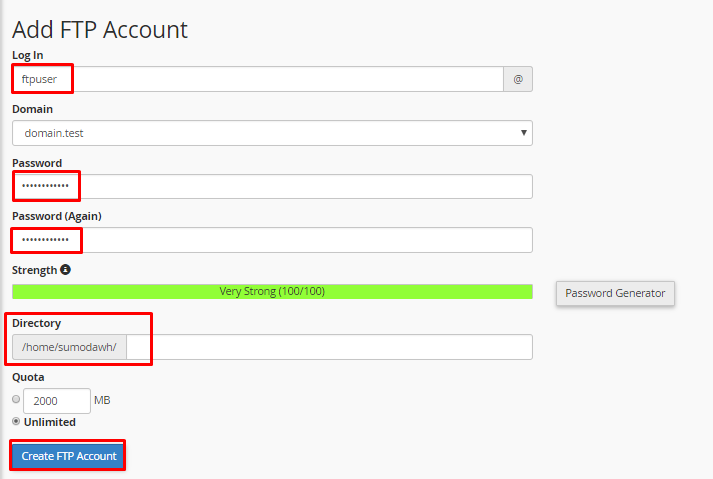 Quota: You can limit the amount of space an FTP user can use here, or set them to Unlimited. 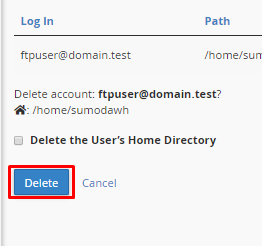 Click the Create FTP Account button. You will then see a message stating "Account Created"
Two buttons will drop down, choose if you want to Delete Account, or Delete Account and Files. If you're not sure which option to select, then choose Delete Account. If you need to, you can always go back and delete the uneeded files. Then, the account will no longer be listed.